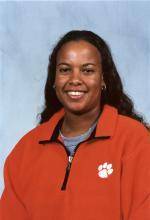 CLEMSON, SC – The Clemson women’s tennis team concluded the singles competition of the Clemson Fall Invitational on Sunday morning in Clemson. The Tigers’ Richele LeSaldo won the flight five singles championship, while Julie Coin, Anna Dolinska, Sunnie Harmon and Ana Stiglic finished second in their respective singles flights. LeSaldo defeated Furman’s Marti Morris in three sets (3-6, 6-3, 6-3) to win the flight five championship. She defeated North Greenville’s Maria Macias by default and Furman’s Shannon Moore, 6-4, 6-3 en route to the championship. Four Clemson players finished in second place of their singles flights. At number one singles, Coin fell to Tina Hojnik of Georgia by a score of 6-1, 2-6, 6-2 in the championship match. Clemson’s Stiglic dropped her match in the finals of the number three singles draw by a score of 6-2, 6-7(9), 6-0 to Auburn’s Isabel Rosenbrock. The Tigers’ Dolinska was defeated by Laura Alarcon of Troy State in the number four singles championship match by a score of 6-2, 6-4. Sunnie Harmon fell in the flight six final to Furman’s Caroline Bentley, 6-3, 6-2. Clemson’s Ioana Paun, Laurence Jayet and Ashlea Bowen finished in third place in their respective singles draws. Paun defeated Mary Neill Hagood of Furman by a score of 6-4, 5-7, 6-2 at flight two. Jayet won a 7-6(1), 6-3, decision over Furman’s Shellie Cochran at number three singles, and Bowen defeated Air Force’s Miclynn Crail by a score of 7-5, 6-0 at flight six. The Tigers will travel to Nashville, TN to compete in the Vanderbilt Invitational on Oct. 18-20.